9ct Yellow Gold. Ring is UK Hallmarked for solid 9ct Gold. Diamond Ring. Size P (uk) - 7 1/2 ( usa) Ring sizing details Below . Ring sizing service available, at cost price of £25.00. -Established family run jewellers with over 12 years of Experience. 9ct Yellow Gold. Ring is UK Hallmarked for solid 9ct Gold. Diamond Ring. Size O (uk) - 7 ( usa) Ring sizing details Below . Ring sizing service available, at cost price of £25.00. Diamond has been tested to confirm it is natural. 9ct Yellow gold. Ring is UK Hallmarked for solid 9ct Gold. Diamond ring. Size N (uk) - 6 1/2 ( usa) Ring sizing details Below . Ring sizing service available, at cost price of £25.00. -Established family run jewellers with over 12 years of Experience. 9ct Yellow Gold. Ring is UK Hallmarked for solid 9ct Gold. Diamond Ring. Size Q (uk) - 8 ( usa) Ring sizing details Below . Ring sizing service available, at cost price of £25.00. Diamond has been tested to confirm it is natural. 9ct Yellow Gold. Ring is UK Hallmarked for solid 9ct Gold. Diamond Ring. Size L (uk) - 5 1/2 ( usa) Ring sizing details Below . Ring sizing service available, at cost price of £25.00. -Established family run jewellers with over 12 years of Experience. 9ct Yellow Gold. Ring is UK Hallmarked for solid 9ct Gold. Diamond Ring. Size K (uk) - 5 1/8 ( usa) Ring sizing details Below . Ring sizing service available, at cost price of £19.50. Diamond has been tested to confirm it is natural. This is a beautiful diamond engagement ring. This is being sold as no longer wanted. As it is 18 carat gold its softer than 9 carat gold so there are a few marks on the ring but nothing big ( please see photos for condition). the diamond is stunning 0.25 carat. My mum tells me its size M but cannot be 100% sure. Please feel free to ask any questions you may have and I will do my best to get back to you asap. Collection can be made from Coalville Leicestershire or if required will be posted within 48 hours of receiving payment. Offers below the starting price will not be entertained. There are two matching round cut diamonds in a raised platinum mount. The stones have a fantastic sparkle and look really stunning. The photos do not do it justice it is in excellent wearable condition. 18CT YELLOW GOLD 0.61ct DIAMOND SOLITAIRE RING AND WEDDING BAND SET. These rings are used, but in very good condition. They have been worn for less than 5 years and only need the gold polished to look like new. As you can see in the photos, the diamond ring alone comes with a certificate of authenticity and a valuation of £2660. ABSOLUTE BARGAIN! There are three round cut diamonds in a raised platinum mount. The stones have a fantastic sparkle and really look really stunning. The photos do not do it justice it is beautiful and in excellent condition. The GIA calculations for Old cut stones is length x width x depth x 0.0066 (this factor is 0.0061 for modern brilliant cut stones). The diamond cluster is based around a central Old Mine cut diamond with 6 Old cut diamonds arranged around the outside. 9ct Yellow Gold. Ring is UK Hallmarked for solid 9ct Gold. Diamond Ring. Size O (uk) - 7 ( usa) Ring sizing details Below . Ring sizing service available, at cost price of £19.50. Diamond has been tested to confirm it is natural. Beautiful 9ct Gold 0.15ct Diamond Solitaire Ring~ Size O~ Fully Hallmarked~ VGC! Truly beautiful 9ct yellow gold 0.15ct natural diamond solitaire ring with diamond accents on the shoulders. Fully hallmarked, in excellent new condition! You won’t be disappointed! 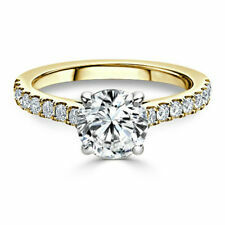 £3k Forever DiamondEngagement Solitaire Ring 18ct Gold 0.61ct over Half carat. Set in beautiful 18ct yellow gold Stamped with 0.61ct inside, as well as full hallmark and 'Forever'. Certification and original packaging was lost, but a box will be supplied. 9ct Yellow Gold. Diamond Ring. Size V (uk) - 10 5/8 ( usa) Ring sizing details Below . Ring sizing service available, at cost price of £19.50. Diamond has been tested to confirm it is natural. -Established family run jewellers with over 12 years of Experience. 9ct Yellow Gold. Ring is UK Hallmarked for solid 9ct Gold. Diamond Ring. Size P (uk) - 7 1/2 ( usa) Ring sizing details Below . Ring sizing service available, at cost price of £25.00. Diamond has been tested to confirm it is natural. Diamond Solitaire Ring Engagement 0.75ct Beautiful Bright Clean Platinum Mount. Macintyres of Edinburgh Diamond Solitaire Ring. 0.62ct Diamond set in 18ct white gold with 18ct yellow gold band. A lovely solitaire 0.25ct diamond ring in 9kt yellow gold. The diamond is very clear and bright with lots of sparkle. The ring itself is in great condition. 1.35 carat Brilliant Cut 18ct Diamond Solitaire Engagement Ring with Valuation. All information about the ring is on the Valuation report from Powell's Jewellers in the pictures, along with the receipt for the Valuation to be carried out. The ring is hallmarked for 18 carat gold. The carat weight isn't stamped on the band but I'd estimate there is around a fifth of a carat diamond in the ring, and it is excellent cut, colour and clarity. Standout With A Unique & Sleek 18Karat Yellow Gold Trillion Diamond Solitaire Ring 0.15 carats . Unique Handmade One-off Piece, Not Available Elsewhere In UK. Diamond Weight - 0.15 carats. Diamond Colour - G.
The ring is made from solid 18ct yellow gold shank andhas a platinum setting and shoulders. Solid 18 ct yellow gold and platinum solitaire diamond ring. This item is 100% real solid 18k / 750 yellow gold and platinum with single stone Real Natural diamond.This is NOT gold filled, NOT gold plated and NOT electro plated ! This ring is made up of 18ct Gold and a single diamond. This Solitaire Diamond Ring is in excellent condition. The Diamond is being held in place firmly and securely and shows no signs of looseness. Beautiful diamond ring in 18k yellow gold size k fully stamped and hallmarked. The ring can be re sized if needed. This sale is for a stunning 18ct Yellow gold Official 0.33ct Brilliant cut Diamond solitaire ring. The ring shoulders and shank are nice and thick showing that this is a quality piece. The Brilliant cut diamond being claw set with wide edge shoulders is of excellent quality. This sale is for a stunning 18ct Yellow gold 0.25ct Brilliant cut Diamond solitaire ring. The ring shoulders and shank are nice and thick showing that this is a quality piece. The Brilliant cut diamond being 6 claw set to coronet gallery with wide knife edge shoulders is of excellent quality. This sale is for a stunning 18ct Yellow gold Official 0.20ct Princess cut collet set Diamond solitaire ring. The Princess cut diamond being set to a square collet with wide knife edge shoulders. The ring shoulders and shank are nice and thick showing that this is a quality piece. The certificate is included with the ring. 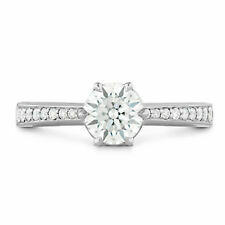 The ring is hallmarked and the diamond weight is engraved on the shank. Stones: 1 Natural diamond weighing0.52ct. Diamond Colour: J.